The 2010 Mustang GT comes standard with the 315 horsepower 4.6L V8, newly designed low profile rear decklid spoiler, and upgraded wheels. Also the outside the GT front end includes a wide lower grille, black dividers between the large round headlamps with integrated turn signals and the grille with fog lamps and black chrome pony emblem. Grabber Blue 2010 Mustang GT coupe with 19 inch premium painted nickel aluminum wheels, all black grille with fog lamps and dark pony, and a 4.6L V8 rated at 315hp (at 6000rpm). Check out this black 2010 Mustang GT coupe. It has the optional 19-inch Premium Painted wheels. Under the hood is the 4.6L 3V OHC V8 engine which is connected to 5-speed manual transmission. Sterling Gray 2010 Mustang GT coupe owned by Will from Spring, Texas. It has the 4.6L V8 engine and manual transmission. Red Candy 2010 Mustang GT coupe owned by Michael Sulzbach from Oklahoma City, Oklahoma. It has the 4.6L V8 engine and a manual transmission. Michael tells us, "Owned since November 2009. It's a 2010 Candy Red Track Pac, added, Graphics Express striping, UPR rear lower and upper adjustable control arms, rear lower control arm relocate brackets, Boost Bros long tube stainless headers, off road H-pipe, Bullitt aluminum engine mounts, Steeda Pro-Flow cold air intake, Ford Racing performance parts 'HOTROD CAMS', drilled and slotted rotors, JDM Engineering SCT CUSTOM TUNE. It can be seen in the July Issue of FFMM, 5.0 and FF at the NMRA Spring Break Shootout in Bradenton Fl, took runner up in the Superstang Class, also in July Issue of Race Pages, attended the National Mustang Week in Myrtle Beach 2010, Mississippi 'GULF COAST CRUISE IN' 2010. It has about 20k miles." Sunset Gold 2010 Mustang GT coupe with fog lamps, dark chrome grille pony emblem, 18 inch wide spoke painted aluminum wheels. These wheels are standard on the 2010 GT. Kona Blue 2010 Mustang GT owned by Richard Peoples from Orlando, Florida. This was our featured Attitude Of The Week starting August, 8, 2010. Richard tells us more, "Purchased December 23rd 2009. She was a Plain Jane when I bought her. But, I realized how much potential she really had. I replaced the factory rear fin with a new raised four post fin. Added a hood scoop along with side scoops and side window louvers. I installed the 10-inch dual stripes from front to back. Also installed the white rocker panel graphics. Whited out the front mustang emblem as well as the side scoop inserts. In my opinion, she looks a heck of a lot better than the 2010 SHELBY. Installed extreme hood prop hinge kit along with a strut tower brace. Replaced the original mufflers with SLP loud mouth muffler deletes. Sounds great! Installed Pypes catted X-pipe and it sounds even better! Installed a Granatelli 62mm throttle body along with a Roush cold air intake system. Man she's fast now!" Sunset Gold 2010 Mustang GT coupe owned by Guy Santostefano from Port Jefferson, New York. This GT has the 4.6L V8 engine and a manual transmission. Guy adds, "This was a leftover 2010 that was purchased late in the year. It was a dealer spec car built as a Premium GT, with rear axle upgrade, all the trim packages, and every possible upgrade. I added the Sumitomo tires and black wheels - staggered sizes. I think it's probably a one of a kind." Red Candy 2010 Mustang GT coupe owned by Donald Brown from Farmingdale, New York. It has the GT Premium Package, 3.73 rear end, 19-inch wheels, a SCT tune, and Flowmasters. Donald purchased it new in August 2010 and it has 4000 miles on the clock. Red Candy 2010 Mustang GT convertible owned by Luc from Canada. It has the 4.6L 315hp V8 engine and an automatic transmission. This is our featured Attitude Of The Week for the week starting March 2, 2013. Luc tells us, "I bought my Mustang off the internet from a dealer in Toronto. I didn't sign before test drive and virtual fell in love right away - the sound of the V8 and the new look. I only drive it in the summer and its still like new. I can't wait for summer. I have added stripes to my Mustang in 2012. I could not find anything on the internet or any custom shops, so I designed my own. I have had many comments about them and I am glad to say that most people like it. Hope you guys like them too!" This Sunset Gold 2010 Mustang GT is owned by Paul Alexander of Fort Macleod, Alberta, Canada. The sun really shows off the color, absolutely amazing. This Mustang GT has the optional 19 inch bright machined aluminum wheels,. Torch Red 2010 Mustang GT coupe owned by Steve Schatten from Milford, New Jersey. This is our featured Attitude Of The Week for the week starting August 24, 2014. Steve tells us, "Bought in September 2011 after attending a car show. Unusual Mods include; Killerglass radiation hose, carbon fiber hydrodipped interior panels, custom exhaust from Bocella's Performance, TCI ratchet shifter, and custom airbrushed pony [front emblem] painted by renown artist Jason Oberly. This Mustang was the inspiration for the birth of the Red Mustang Registry, which now has over 4500 members in 30 countries worldwide." Check out this high resolution photo set of a Sunset Gold 2010 Mustang GT coupe with 18 inch wide-spoke painted-aluminum wheels (standard on the 2010 GT and GT premium). Here is a new Black 2010 Mustang GT convertible with optional 19-inch Bright Machined Aluminum Wheels that I photographed at the Lake Michigan waterfront while visiting Milwaukee. It was being auctioned off at a fund raiser. Ford rendering of a Kona Blue 2010 Mustang GT with custom Ford add-ons: billet upper and lower grilles, lower grille accent lights, custom wheels with white trim rings, and large rear spoiler. Ford says, The 2010 Mustang's lower, more-aggressive stance makes it seem ready to charge from the starting gate. The dropping fender line running into the belt-line kick-up and rear haunch give the impression the car squats down slightly in an aggressive stance. Check out the Mustang Customizer on FordVehicles.com. Make your own screen background and also see where you can order the customized parts. Some of the options I selected for this car include a glass roof, sunset gold clearcoat for the upper body and black for the lower body and a tape side stripe which would be a custom aftermarket addition as well as a Ford addition, Roush body kit by Roush which mainly changes the front end, pedestal rear spoiler which you can purchase from FordAccessoriesStore.com, billet style grille which you can get from aftermarket places like American Muscle, black satin hood scoop which is close to Ford 2010 Mustang accessory AR3Z-16C630-AB or an aftermarket version, left and right side scoops from Ford AR3Z-63279D37-AA and AR3Z-63279D36-AA, left and right rear quarter window panels AR3Z-63280B10-BA and AR3Z-63280B10-AA, and 20 inch custom painted wheels which Ford may have but there are many aftermarket options. 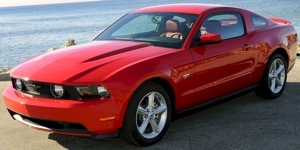 Here is a Ford promotional photo of the Red Candy 2010 Mustang GT coupe. Red Candy is one of 5 new Mustang colors for 2010. See our 2010 Mustang Data Explorer to see all the 2010 colors. New to 2010 is the lower front grille, a low cowl hood, a raised look of the rear lights, color keyed mirrors, a new line up of wheels including a 19 inch version, several seat color options, and a redesigned dash. Sunset Gold is a new color for 2010. This is a nice low view of the 2010 Mustang GT convertible with 18 inch wide spoke aluminum wheels. This view shows off the special GT front end which includes a wide lower grille, black dividers between the large round headlamps with integrated turn signals and the grille with fog lamps and black chrome pony emblem. Kona Blue is another new color for 2010. This view of the 2010 Mustang GT shows off its new front grille which is unique to the GT and rear spoiler. Sunset Gold 2010 Mustang GT coupe with the GT grille, 19 inch bright machined aluminum wheels and glass roof. The 2010 Mustang next to it, to the right in the photo, is another new color for 2010. It's a Brilliant Silver 2010 Mustang. This is a Ford promotional photo of a Kona Blue Mustang GT convertible. Cannot tell which type of wheels are on this car, but they do come in optional sizes up to 19 inches. Check out this Torch Red 2010 Mustang GT coupe. It has the new red interior. The lighting on the hood is cool. You can see the two opposing ridges from the raised cowl and from the nose. This Kona Blue 2010 Mustang GT was being shown at the Central Illinois Mustang Association's show at Dennison Ford in Bloomington, Illinois. It has a black interior. Check out the body colored side mirrors. Grabber Blue 2010 Mustang GT coupe on display at the 2010 Mustang and Ford car show at Uftring Ford in East Peoria, Illinois. This one has big 19-inch wheels and a black interior with blue stripes on the seats.